When a company succeeds in solidifying a major partnership, it’s time to celebrate. However, brainstorming and trying to find the right corporate gifts for an entire office can be difficult and time consuming. Whether it’s your partner or another key leader who lead the deal, corporate gift baskets are a fun and unique way for the whole office to celebrate big accomplishments. World of Thanks 3 Tier Tower – There is no better way to show your appreciation for a corporate office than with a 3 tier tower of gift boxes stocked with sweet and savory snacks. Packed with a variety of comfort goodies, this is the perfect gift for celebrating big accomplishments! Go for the Gold Gift Tower – Against other corporate gifts, this impressive 6-tier tower takes the gold. When stacked, this ornate tower of treats stands at about 20 inches tall. This unique corporate gift tower is an extravagant, and sweet, gift that is guaranteed to please small or medium sized offices. Elegant Stripes 5 Tier Tower – Recognize your team for a job well done with these elegantly arranged gift boxes that are easy to distribute throughout the whole office. This is one of our more unique corporate gift baskets because it features a selection of our best gourmet treats that can satisfy any sweet tooth. Bisket Baskets’ unique corporate gift baskets are the finest choice when looking for gifts to celebrate corporate wins! If your boss is a known wine lover, here is a great gift for his/her wine collection. The Corporate Executive Wine Themed Gift Basket is unique because it doesn’t have wine! This basket includes a variety of treats that compliment any glass of wine. The Wine Glace included is perfect for making delicious frozen wine drinks. The Mile High Pawsome Friends Gift Basket features snacks and treats for all pet lovers. It’s a unique corporate gift basket for any business executive that loves their four-legged companion! 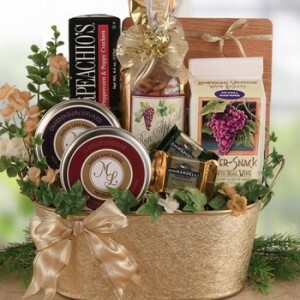 Our Epicurean Delights Gift Basket is the perfect combination of uniqueness and high-style. The smoked salmon and premium chocolates are sure to make any executive smile; especially ones who enjoy the finer things in life! You don’t need to settle for a regular gift basket! Bisket Baskets offers a variety of corporate gift baskets that are unique for every business professional. 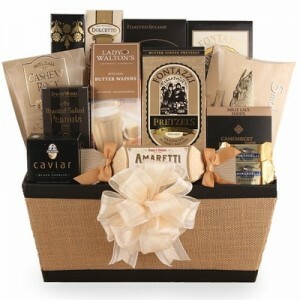 Browse our collection of unique corporate gift baskets at BisketBaskets.com! Is your recipient is dedicated to outdoor during the summer? Then they’ll appreciate The Great Outdoorsman basket. Packed with smoked meats, smoked salmon, and tons of other savory snack foods, they can pick this basket apart and take with them on their next adventure. 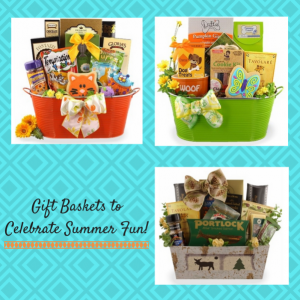 If your recipient spends the summer with their favorite four legged friend, then these baskets are for them. The Sunshine Dog & Owner Gift will be a big hit with both of them. This basket has treats for both pups and humans to enjoy. What if your recipient has a cat? We have a basket for them too! The Sunshine Cat & Owner Gift has tasty treats and even a couple toys for summer fun. Also, your cat will probably appreciate the metal basket it comes in as a new sitting spot too! There’s plenty of gift baskets and more at BisketBaskets.com to choose from! Find the perfect gift to fit the season today and start celebrating summer! The Polka Dots and Posies Floral Bouquet ($58.99) will instantly brighten up any work space. This cute pink decorated vase holds a variety of beautiful posies and roses that your co-worker will love. Gourmet treats in a lovely reusable tin? What isn’t to love! The First Class Gourmet Gift Basket ($74.99) is filled with delicious sweet and savory treats that fit any palate. Candy is a workplace staple, so make sure they have enough for their next candy break! The Radical Reese’s Candy Bouquet ($57.99) has an assortment of Reese’s candies arranged in a fun bouquet. 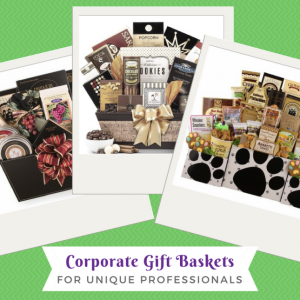 There are plenty of other executive gift baskets and goodies to choose from for your administrative professional on BisketBaskets.com. Shop our baskets now to get your order in on time for the holiday. And don’t forget! 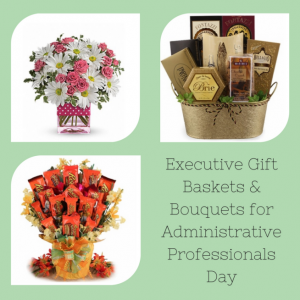 Administrative Professionals Day is April 26th! Getting a new client is always an exciting time that is crucial for building a productive work relationship. Showing you care, you’re ready to work, as well as your gratitude for their business is all part in building that relationship. To do this, consider sending one of many unique corporate gift baskets to show this gratitude. Here’s a few that your new clients would love to get! Simple, yet completely effective, this Thank You Gift has a few gourmet favorites in a colorful container. Cheese, olives, and a couple other sweet treats will have your new client smiling. 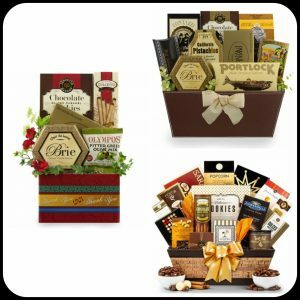 A timeless gift basket, the Executive Classic Gift Basket has all of the gourmet favorites everyone looks forward to when a gift basket arrives. Your new client will love the mix of sweet and savory snacks in this classy basket. For the very special new client, try sending this decadent gift basket. The Epicurean Delights Gift Basket has all of the super indulgent cookies, chocolates, and snacks that they will extremely appreciate. Still not sure what which one of these unique corporate gift baskets to send your new clients? Visit BisketBaskets.com to check out all of our corporate gifts. 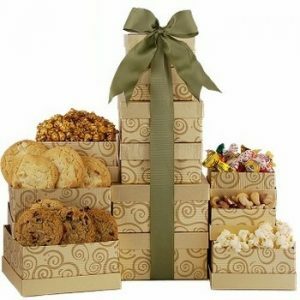 From baskets, candy bouquets, and cookie boxes, you’ll find the perfect thing to send to your new clients. Sending the same executive gift baskets to your clients can get a little stale. Spice things up a bit and send them a cookie gift box! Packed with delicious traditional and decorated cookies, your recipient will love this sweet surprise. Check out these cookie boxes as an alternate! Packed with a variety of sweet treats, this box has just a little extra than delicious cookies. The Go for the Gold Treat Tower has candies, chocolates, two types of cookies, two types of gourmet popcorn, and mixed nuts to satisfy any sweet tooth your clients. Know your recipient loves chocolate? Then this pair of cookies and Ghirardelli Chocolates is for them! This Ghirardelli Chocolate & Cookie Tower has a classic combo of goodies that is sure to please. Need a “Thank You” that really shows your appreciation? This Thank You Cookie Gift Box has you covered. Filled with two types of cookies, along with a couple royal icing decorated cookies will show your gratitude. 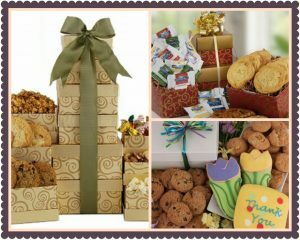 Next time you’re thinking of forgoing executive gift baskets for your clients, think about sending a cookie gift box! BisketBasket.com has all of the corporate gifts you need to stand out. From classic gourmet gift baskets, to fun candy and cookie bouquets, you’ll make a statement that your recipients will definitely remember! From PTA fundraisers to church picnics, everyone loves a good basket raffle. 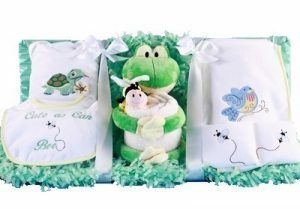 There are a myriad of different baskets you can choose from, but meal gift baskets are always crowd pleasers. Everyone loves food, so you’ll be sure to get people to drop their raffle tickets in the jar for these three incredible edible baskets. Pizza is the ultimate favorite food. Unless you’re lactose intolerant it’s hard to pass up a slice. This yummy basket gives you everything you need to have that fresh baked pizzeria experience in your own home. The basket includes enough pizza crust mix to serve 8 people, a mozzarella cheese bar, pizza sauce, roasted garlic bread spread and even kitchen towels and oven mitts. Italian food makes the best comfort food. Packaged in a beautiful wooden container, this meal gift basket features everything you need to make a lavish pasta meal, just like Grandma used to make. This basket is perfect for given the lucky winner an authentic taste of Tuscany in their own home. This Rustic Country Gourmet Gift Basket is perfect for warming the heart and soul. Packed with hearty comfort food like veggie stew mix, and buttery hand-iced cookies, this basket provides a delightful homey feel. This basket is also truly built to last with a beautiful wooden container that can be repurposed for anything. 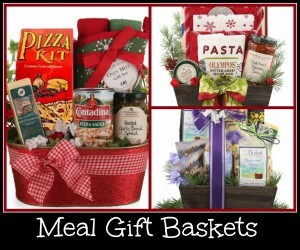 Make your raffle a hit with these delicious meal gift baskets from BisketBaskets.com! Who doesn’t love a good gift basket during the holidays? Especially those that are filled with delicious goodies, treats, and other great holiday flavors that everyone can enjoy. When you’re getting ready to give your clients a corporate holiday gift basket this season, our selection has everything you need and more to spread holiday cheer. Here are three reasons why our corporate holiday gift baskets are a great gift to give your clients this year. They’re delicious – Packed with gourmet treats, candies, and cookies, our corporate holiday gift baskets are ideal to give to your clients because they’re scrumptious! Take our ‘Golden Gourmet Holiday Gift’ that’s stuffed with luxurious treats like smoked salmon, caviar, and plenty of our goodies that are sure to tantalize their taste buds! They’re ready to ship wherever you are – Not only are they filled with the most delicious treats, but also they’re ready to ship to your clients wherever you are and wherever they may be in the US! Making sure that you give yourself at least a week’s notice, we can ship your basket to your client so they receive a sweet, thoughtful holiday gift that they can enjoy. They’re already packaged – What’s the greatest thing about a gift basket? Some may say the goodies inside (which is very true), but most will say the fact that it’s already put together! Shipping our corporate holiday gift baskets to your client this holiday season can put your mind at easy and save you time! Want to check out the rest of our holiday gift baskets? Visit us today at BisketBaskets.com!